This event is generously sponsored by Piasecki Aircraft Corporation and the Pitcairn Family Foundation. This sign-up page is for active Philadelphia Chapter members only. Please log in with your member credentials at the top right corner of this page to activate the registration process. If you are attending Forum 75, please purchase the tickets here as a part of your registration. Please DO NOT register here. 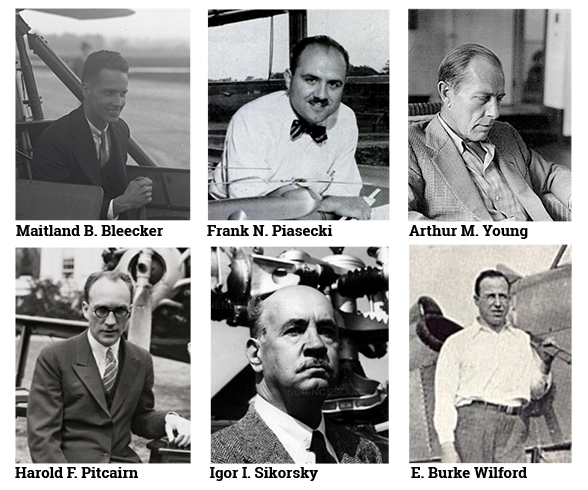 This special evening begins at 6:30 PM with a facilitated panel discussion featuring immediate family and friends of the original helicopter industry pioneers, followed by an invited reception at 7:45PM with Mr. Neil Weaver, Executive Deputy Secretary at the Pennsylvania Department of Community and Economic Development (DCED), in Franklin Hall.Tickets are limited! Thanks for your interest in the Forum 75 Franklin Institute Historic Evening! This event is open to current VFS Philadelphia Chapter members only. If you are a member, please log in using the form at the top of this page. If not, please consider joining or renewing your membership!